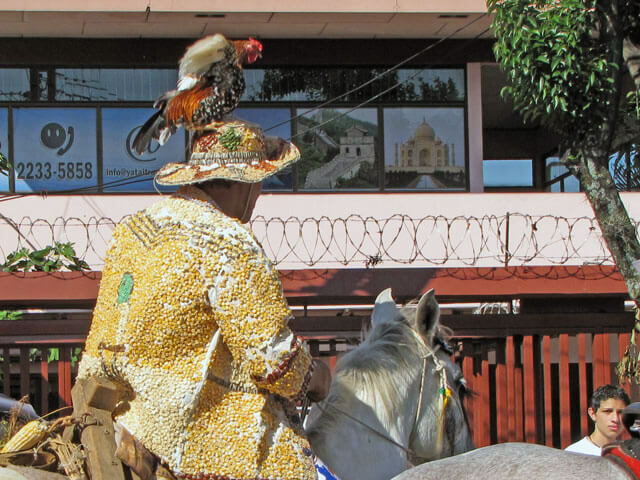 I agree that seeing a rider with a rooster on his head is not a common sight but I did spot one at a Tope in San Jose, Costa Rica! Horse parades, known as ‘Topes’ in Costa Rica, are traditional events that mark important cultural celebrations in Costa Rica. Historically, each city or town held festivals in honor of their patron saint and a significant part of these festivities was the horse display. 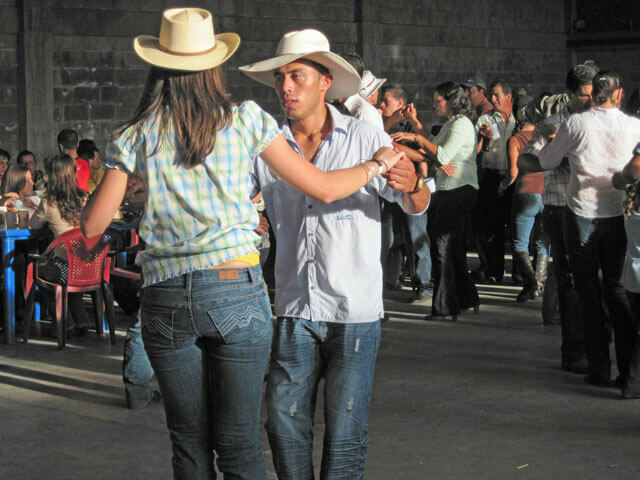 Topes are now held more as fundraising events for charitable causes and an excuse to throw a party, Costa Rican style! 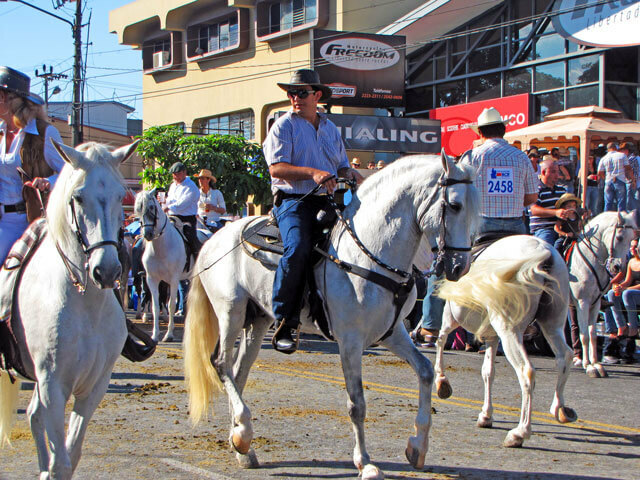 Topes and cabalgatas (a kind of informal tope) as well as horse games, such as Carrera de Cintas, are seen in every small village throughout Costa Rica. 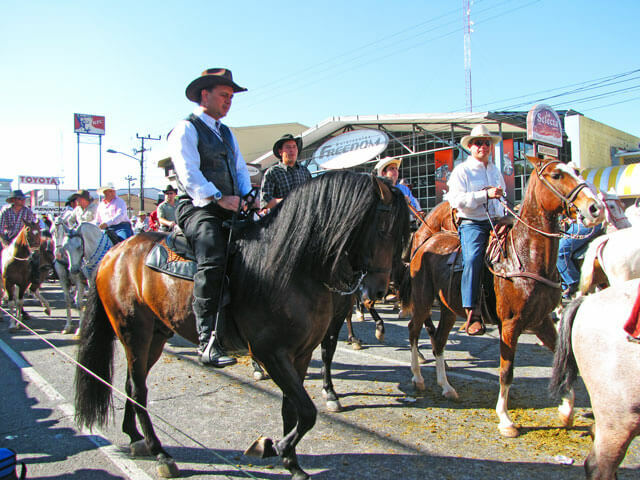 With the prevalent cowboy culture in rural Costa Rica and their obvious love of horses these enjoyable events still play a part of Costa Rican life. If you’re choosing to go horseback riding in Costa Rica, and happen to be in the area at the right time, topes offer a real treat not to be missed. 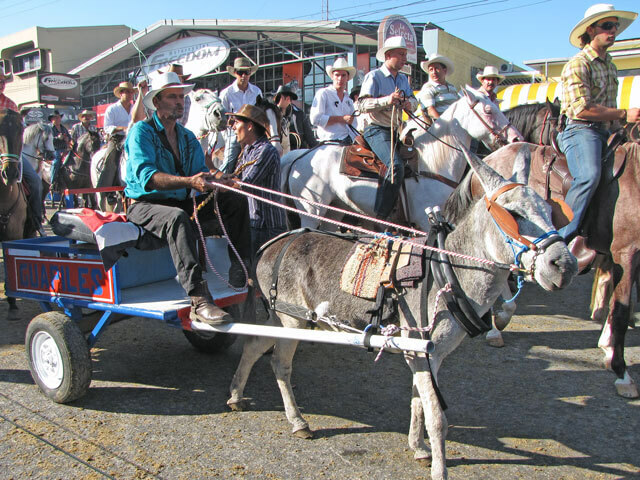 Travelers of all ages would appreciate the horse parades that are so much loved by Costa Ricans. The inclusion of this colorful tradition in Costa Rican culture was heavily influenced by the Spanish and a by-product of colonial times. While topes may have been brought by the Spanish, as in all things Costa Rican, their own unique special flare was incorporated to make them a national affair. Topes constitute part of a fiesta occurring over a few days along with bull-runs, food stalls, live music, and dancing: displaying the colorful and exotic culture of Costa Rica. Of prime importance during the fiesta are the raffles held after the topes to raise money. It is not uncommon to find saddles and riding equipment offered as prizes and at the very largest festivals, calves and young horses are the most sought after jackpot! 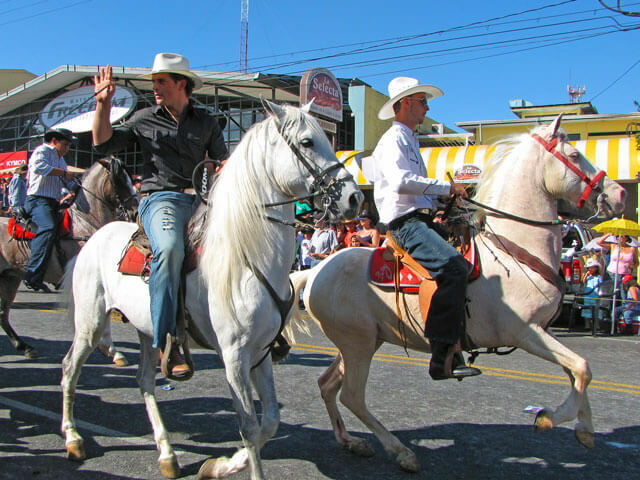 The most famous and largest of horse parades can be witnessed in the capital city of San Jose, and to a smaller extent in the city of Palmaras. These topes are so widely known that visitors come all the way from Nicaragua and Panama to attend them. On display are thousands of horse riders who gather to showcase their impressive horses and riding talents and even their custom designed cowboy outfits. But not only seasoned riders attend, the events are popular events for families with their pet horses and you will also see ‘special’ mounts which include mules, donkeys and even water buffaloes! 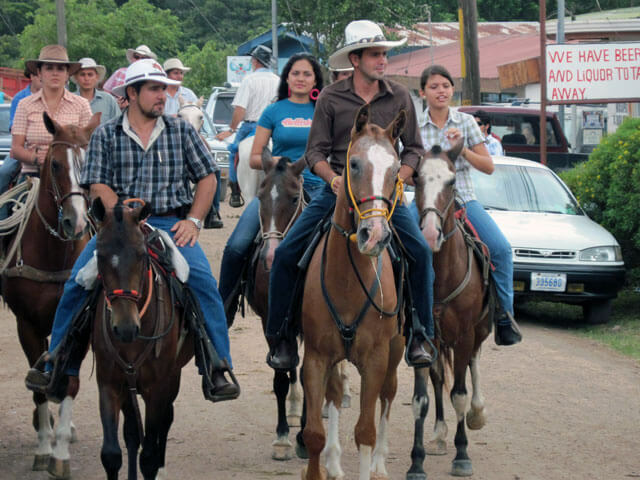 Many smaller towns and villages have events called ‘cabalgatas’. These are also held us community fund raisers and part of the festival of the area. They are similar to topes but less formal and generally held in the rural areas with longer rides on beautiful trails in the countryside. An excuse to get drunk on horseback for many! "Carrera de Cintas" (belt race) on horseback is a popular horse game which puts to the test the skills and expertise of competing riders. 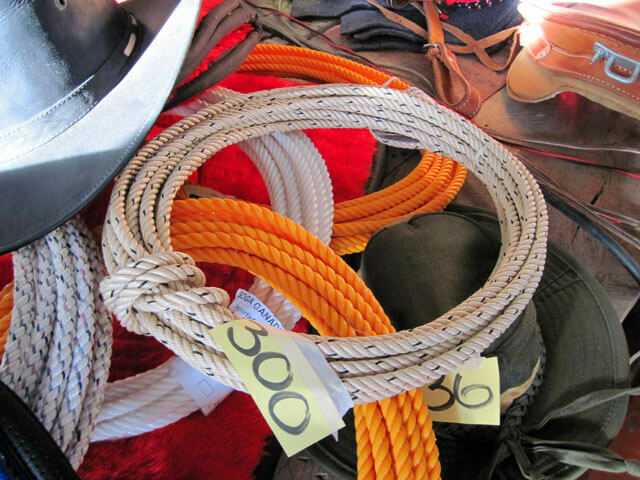 Short belts with rings on one end are hung from the middle of a rope strung between two posts or trees. The aim of the game is for galloping riders to try and spear the tiny ring. The pencil-sized spear (estaca or a stake) used by riders is a shaped piece of wood often carved by the riders themselves. Speed, agility, great eye-hand co-ordination plus a cooperating horse are a winning combination. The game is not easy to play and very few riders actually spear a ring but a lot of fun is had by all. An entry fee for the Topes and Carrera de Cintas is required. The fee paid which revolves around $20 per person is used to raise funds for charitable causes in the village. 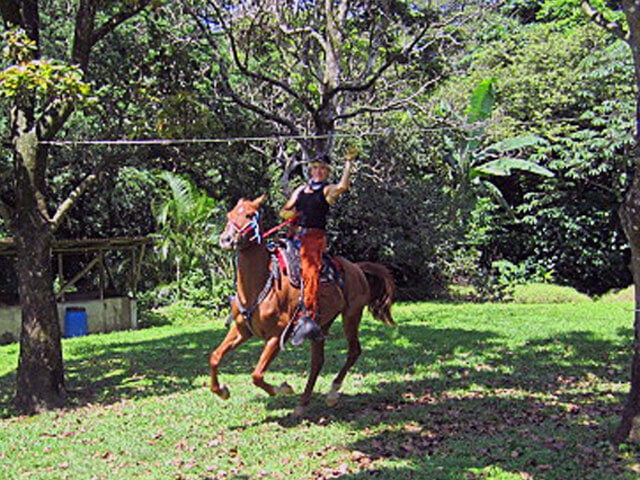 Horseback Riding in Costa Rica can be extra special is you manage to watch a tope or try your hand at one of the horse games in Costa Rica. If you are visiting Costa Rica and want to go riding, you may also be able to participate in one of these events. 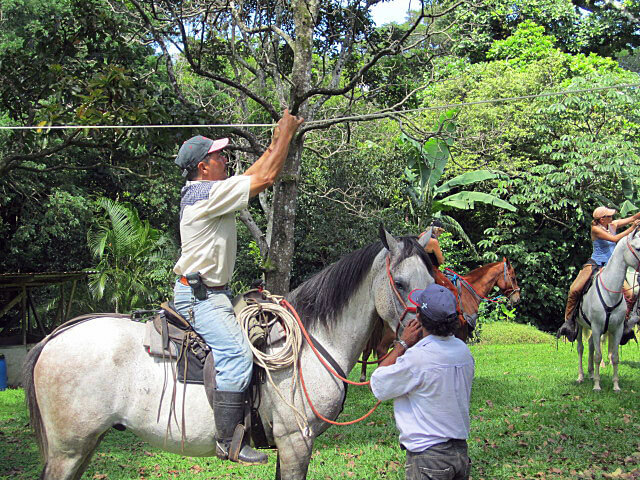 You can contact Horse Trek Monteverde and check if one is taking place.